Title: 08/28/1992 - Requirement for MSDSs with hazardous chemicals. This is in response to your letter of July 24, to the Occupational Safety and Health Administration (OSHA), written on behalf of your constituent Mr. Robert J. Stein, Jr., of Delmar, New York. Mr Stein wrote to you concerning his inability to obtain a Material Safety Data Sheet (MSDS) for a product to which he was exposed in 1989. Mr. Stein does not indicate whether or not his exposure to the chemical, "Hillyard Extra Strength CSP Cleaner," occurred during workplace operations. 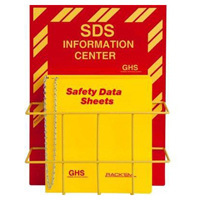 Under OSHA's Hazard Communication Standard (HCS), 29 CFR 1910.1200, chemical manufacturers and importers must transmit a MSDS with the initial shipment of a hazardous chemical to the downstream employer(s) to whom they supply the product, and again if the information on the data sheet changes. There is no requirement on the part of manufacturers and importers to provide MSDSs for non-occupational uses, and MSDSs are not required to be sent to OSHA. OSHA does not collect or retain a repository of data sheets; their transmittal to the downstream workplace is solely the responsibility of the manufacturer or importer. Therefore, if Mr. Stein's exposure came from workplace use of the chemical, he may wish to contact his former place of employment and ask to be provided with a copy of the MSDS for that product. OSHA's "Access to Employee Exposure and Medical Records: standard, 29 CFR 1910.1020, specifically identifies MSDSs as employee exposure records. If the MSDS is the only record of exposure, then the MSDS must be maintained by the employer for at least thirty years. The employer may have retained a record of the formulation of the chemical in lieu of retaining the data sheet, and under 1910.1020 Mr. Stein may obtain this information from his employer. Mr. Stein may also want to contact the manufacturer directly, Hillyard Floor Treatments in St. Joseph, Missouri, to request a copy of the MSDS for the product. We hope this information will be helpful to you and your constituent. Please feel free to contact us again if we can be of further assistance.